I needn’t remind you that there are countless adaptations of this story, on film and on stage. Searching Netflix, I found at least 12 options to chose from, more if you’re willing to pay for a rental on Amazon Prime but I admit I’ve mostly stayed away, wondering what Jane Eyre has to offer in the modern age. … Says the woman who quietly, hypocritically, obsesses over Jane Austen’s canon. Silly me. Polly Teale’s adaptation, performed by Northwestern University students through tomorrow in the Josephine Louis Theater, is a fresh re-imagination, unlocking some of the story’s contemporary takeaways while remaining true to the Victorian setting. Period costumes occasionally hide the eight actors’ bare feet, each of whom — except for Caroline Chu as Jane and Lucette Panush playing a bewitching Bertha Mason — switch roles as the story progresses from Jane’s childhood home with her wretched aunt and cousins, to the wretched Lowood school, to her post as governess of Thornfield Hall, where she meets her true love, Mr. Rochester. I got kind of stuck on the bare feet, clearly a deliberate choice by costumer Raquel Adorno which led me to think there was something more than meet’s the eye about this interpretation of Jane Eyre. Was it an attempt to “strip down,” the story, so to speak, or unearth its allegorical underbelly? Maybe. The swapping of characters leaves a residue from the ones each actor played before. Initially one of “the cousins,” Saidie Stone becomes Jane’s trusted friend Helen at Lowood, and then her charge, Adele. Amara Leonard does the most shape shifting, beginning as Bessie and playing everything from a humorless Alice Fairfax at Thornfield to the self-absorbed Blanche Ingram and one of St. John’s pious, (though not humorless) sisters. In the opening scenes, Panush appears as the inner psyche of Jane, a reminder that Jane’s virtue did not come without suffering. Panush is on stage nearly the entire play, observing the action from a raised platform hoisted above stage. She is captivatingly mad the whole time, a blend of Jane’s inner demons and Bertha, chained in the upper floor of Thornfield. The idea, for me, is that Jane and Bertha are not so different, after all. In fact, the whole thing lives in a sort of in between space, half way between fantasy and reality, creatively harnessing the supernatural elements which anchor Bronte’s novel. Jane Eyre is understandably remembered as a love story; more so, it’s a lesson in religiosity, inviting us to question personal ontologies and moral compasses. The actors carry a lot of weight, here, not only in playing multiple roles, but by filling in gaps left by a deliberately sparse scenic design (by Scott Penner); a mop and bellows become Mr. Rochester’s dog and horse, for example. And lighting designer Anthony Forchielli casts ominous shadows of the walls, frequently created by having actors move a pair of antique-looking Fresnels about the stage. 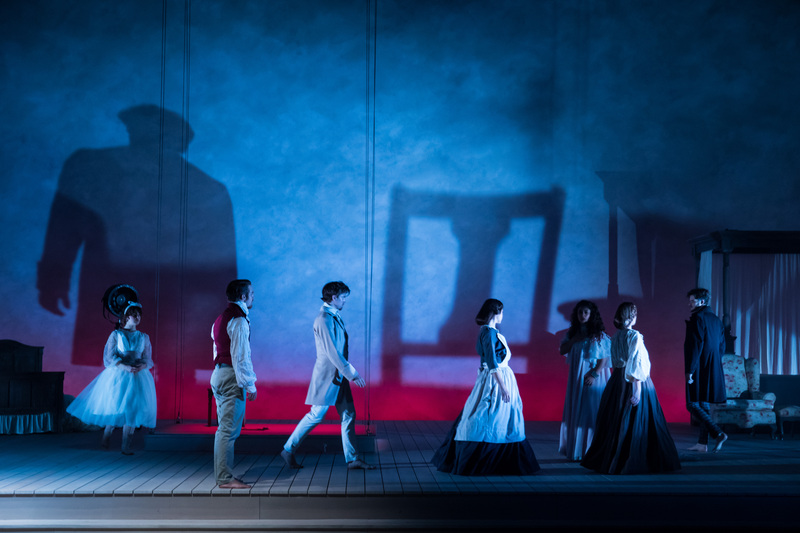 Jane Eyre runs tonight at 7:30 p.m. and tomorrow at 2 p.m. at the Wirtz Center for the Performing Arts at Northwestern University, 20 Circle Arts Drive in Evanston. Tickets are $6-25, available on the Wirtz Center website, by phone at 847-491-7282, or in person at the box office.